This area had a changing role in the free-trade, but even before the smuggling explosion of the 18th century, the Bristol Channel was notorious for smugglers and pirates. The shape of the channel partly accounts for the ease with which vessels could avoid duty: when the King's men were being unusually diligent at Bristol, the ships' masters simply headed for the south Wales coast, and added only a few hours to their journey time. Though such evasion was really an incidental aspect of general trade, 'professional' smugglers were operating in the area as early as 1577. One, a Simon Fferdinando, smuggled some 100 'chestes of sugar', and unloaded them in the Roads of Penarth. ST3088 (map 171). St Woolos Cathedral is on the Stow Hill, some ½ mile S of the railway station. Skinner Street is a continuation of Bridge Street, near the Newport Bridge. The bustling Newport docks concealed a great deal of illegal trading. 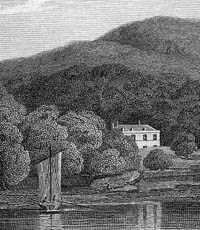 The Salt Survey commented that...'The Usk and the Ebbw received and sheltered many a smuggling craft...for Running' . The opening of the Monmouthshire canal increased the amount of trade through Newport, and smuggling expanded, too. In 1804 the collector of customs admitted that '...the running of goods up the Usk has frequently been attempted and sometimes with success as we are assured'. This glimpse of a genuine smuggler is a rare one, and the records of the Newport custom house provide much greater detail about the minutiae of life in the service of the King, and about every hair-pin seized by the preventives. The level of seizures listed, though, is no real guide to the amount of smuggling that went on, and this is amply illustrated by the fact that there was a rise in goods seized locally after 1830, a time when smuggling nationwide was on the decrease, owing to changes in the levels of duty. Many of the merchant seamen found guilty of smuggling in this period were pressed into the navy — this in itself being considered sufficient punishment. Small seizures were common, but there were also a number of bigger hauls at Newport that provide an interesting if oblique insight into the way that the Newport smuggling trade was organized. A case in point was the 72 ton schooner ironically named Good Intent. This ship was owned by a consortium of five Newport businessmen, one of whom had strong links with the revenue services. The ship apparently plied a perfectly innocent trade with France, but when passing through Mounts Bay in 1837 a close inspection by a revenue cruiser revealed that the intents of the captain and merchant owners were far from good. The schooner had false bulkheads concealing 1100 gallons of Brandy in 259 small kegs. The ship was cut up, and the master was sentenced to a long spell in Monmouth gaol. Significantly the owners simply lost their ship. Today there's little remaining to connect Newport with the smuggling of the 18th and 19th centuries, but Skinner Street was the site of an incident as late as 1867. A hawker stole a firkin of butter from a Mr Mathews' warehouse, and a search of his lodgings uncovered 70lbs of uncustomed tobacco. There is also a persistent rumour of a tunnel leading from the River Ebbw to St Woollos Cathedral . This area was a popular landing site in the late 18th century, and within a stone's throw of major markets at Cardiff and Newport. In 1784 customs officers seized nearly 10,000lbs of tobacco, and 40 gallons of brandy, and a couple of months later a further 130 gallons of Brandy. Even today the area is quite isolated, and consists mainly of salt-marshes, criss-crossed by dykes and drainage ditches. Houses are few and far between, and anyone landing goods over the sea wall could do so with little fear of interruption. The principal illegal imports at Cardiff were wine, spirits and tobacco , but cargoes also included salt and some other extraordinary items: 14lbs of human hair were seized in 1733 by vigilant customs officers! It appears that the Cardiff customs authorities — or at least some of them — were in league with the smugglers, because a directive from London in February of 1690 admonished the Cardiff men and called for greater diligence in the execution of their duties. Though some of the contraband may have been imported via the town quays with the connivance of the authorities, much of the tobacco was landed in the surrounding creeks, such as the river Rumney, and quickly distributed to the 80-100 illegal tobacconists in the town. The local smugglers used the usual range of ruses to conceal their goods, and at one stage, importers of hillingstones (roofing tiles) were known to be hiding contraband under their bulky cargoes. 'Penarth Bay is a member of the port of Cardiff' commented the Salt Survey...'likewise a very convenient Place [for smuggling]'. Sully Sound is at ST1667 (map 171) 3 miles or so E of Barry. Leave the B4267 on the outskirts of Sully, and turn down Beach Road. The Pot Inn has faded from memory, and the Manor House has been turned into flats, but the well remains, in the courtyard of the pub, 'The Captain's Wife'. Sully beach is a series of rocky shelves, and you can walk to Sully Island at low tide. Take care, though, as the currents can be lethal when the tide rises. 'the flow of water could be stopped, and what remained pumped out. Underneath the false bottom was a vault in which a horse and cart could easily have been turned. It was evident that smuggling had been carried on here extensively, but so secretly that it was not even suspected'. Barry Island has a benign appearance today, but this hides a chilling history. It was once a true island, and the private domain of smuggler Thomas Knight. He put fortifications around the shoreline, and ran a fleet of heavily-armed smuggling ships from there, importing spirits and tobacco from the Channel Islands, and soap from Ireland. Knight probably arrived in Barry in 1783, in a 24 gun Brig called the John O'Combe. Opposition from the customs authorities was at first nominal, and with support from local people, Knight quickly made the island his stronghold. The customs men may well have exaggerated the problem, but Knight was reputed to have a force of 60-70 men defending the island from uninvited interest. Knight's influence grew rapidly, and within a year or so, the customs authorities had difficulty recruiting members, since the local population had more respect for Barry's smuggling king than for the legitimate crown. Knight's crews did not hesitate to fire on preventive vessels, and the crews of the revenue cutters evidently went in fear of their lives. On occasions the custom house boats refused to give chase, the crew claiming justifiably that there was no pension scheme for customs men injured in the line of duty. To counter this, a £10 payment was introduced for mariners who lost a hand or foot, and free medical treatment for any injury. Knight was implicated in the heavy seizure of tobacco at Goldcliff in 1784, and some indication of the importance attached to his influence in the area can be gained from the fact that the seized goods were taken to Cardiff under armed guard, at considerable expense. The local people refused to help with the transport, because they were terrified of how Knight would exact his revenge. Knight's reign was brief, and in 1785 a concerted effort by the authorities dislodged him — he retreated to Lundy. His place was taken by another smuggler, named William Arthur. Arthur proved as tough a nut to crack as his predecessor, and the local collector of customs estimated that it would require the efforts of 60 dragoons to once more make the island safe. However, for reasons that are not entirely clear, the contraband trade from Barry had petered out by the end of the eighteenth century. ST2265 (map 171) 6m E of Barry. The island is a nature reserve, with no regular public boat service. However, landing is permitted (on payment of a fee). The strategic position of this small island in the middle of the Bristol Channel made it the ideal base for smuggling activity, with easy access to both English and Welsh sides of the channel. The island is clearly visible from the mainland in good weather, and the loading and unloading of cargoes was carried out in full view. However, the customs authorities were for many years powerless to stop the illegal trade, since they lacked a boat to take them out across the six-mile stretch of water separating Flat Holm from Wales. The Old Swan here was a smugglers' meeting place, and at the back of the pub a concealed staircase still leads up to what was once an attic storage space. The upstairs room adjacent to the staircase is much smaller than common sense would suggest it should be, and the stairs are hidden in the thickness of the wall. The entrance to the stairs can be seen through a small window overlooking the pub car-park, but there's no public access. There are also rumours of a tunnel leading from the cellars to the sea. Nash point was the site of a major seizure in 1833: 1100 gallons of spirits were found in a house at Nash, believed to have come from the Kate of Bristol. This vessel had been anchored off Nash Point with a cargo of coal — suspicions had been aroused when it was observed that the coal did not fill her hold to capacity. Local merchants were appalled that the sale of the seizure might cause prices of drink in the area to plummet, so the brandy was sold in London. A visit to the point confirms its suitability as a landing point: the valley behind is wooded, providing perfect concealment for chains of ponies shipping the contraband inland. Smugglers landing at Nash used the high tower at St Donat's Castle as a sea marker, and Henry Stradling, once the owner of the castle, employed the vantage point to keep an eye on local shipping. According to one local yarn, Stradling was attacked on one of his regular trips to France by a privateer, and was held ransom. Though he was released, Sir Henry continued to hold a grudge against the pirates, and eventually captured the man who had made him suffer. The man's punishment was to be buried up to his neck in the sand of St. Donat's Bay, and Sir Henry watched from his tower as the tide rose. Though colourful, this tale is probably a concoction of several local stories, since a similar fate reputedly awaited another local villain called Peter the Pirate! 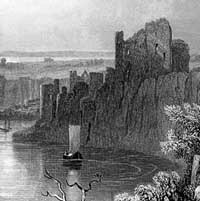 In the 18th century, coal ships from Neath were the principal smuggling vessels, trading with Ireland and returning with concealed contraband. What makes the Neath area exceptional though, and possibly unique, is the nature of the involvement of women in the trade. The local smugglers were led by Catherine Lloyd, who was the landlady of the Ferry Inn of Briton Ferry. The trade continued through the century, still under the control of women. An anonymous informer wrote from Gower to the tidesman at Briton Ferry in 1758, giving the names of four women who had gone from Neath to Bridgewater to buy uncustomed tea. What is not clear from any of these accounts is the exact role of the women involved. Most probably, Catherine Lloyd would have been financing the operation and storing the contraband in the pub, rather than a sea smuggler. My thanks to The Flat Holm Project, and especially the Project Officer, Dr DH Worral and the Island Warden, Andrew Gibson, for letting me visit the island and ferrying me out.